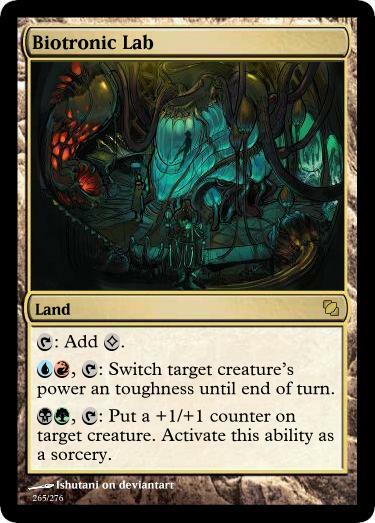 , : Switch target creature’s power an toughness until end of turn. , : Put a +1/+1 counter on target creature. Activate this ability as a sorcery. When ~ enters the battlefield, you may pay 1 life. If you do, add , , or . ~ enters the battlefield tapped with two charge counters on it. , Remove a charge counter from ~: Add or . If ~ has no charge counters on it, sacrifice it. , Sacrifice a creature: Add , , , or . , : Return target creature card from your graveyard to the battlefield tapped and attacking. Activate this ability only during the declare attackers phase. viriss : Oof. That's a lot going on in one card, to the point I wished this was two separate lands instead (even if it is an interesting idea.) 2nd ability doesn't really feel , either, if anything, it's closer to Simic or Selesnya. 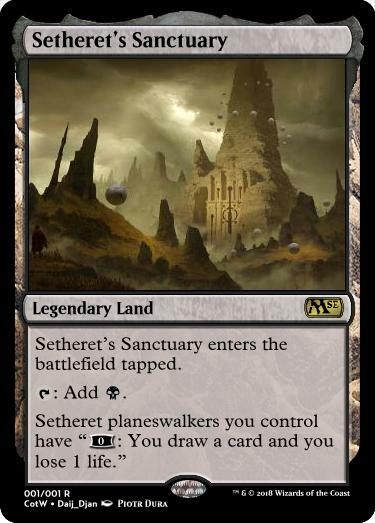 I think for the card to work in its current form (and remain faithful to the challenge) it'd have to be Mythic - without the restriction I'd really advocate for making this two different lands. 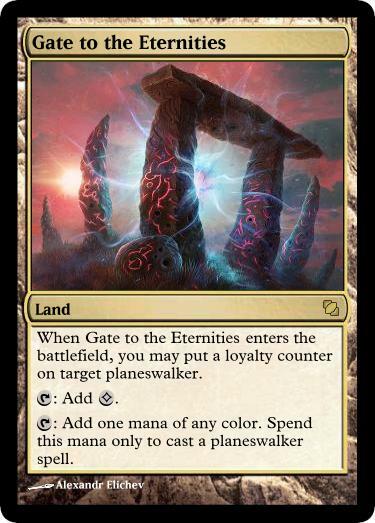 gateways7 : Each ability fits each color it can add and it's both an interesting fixer that can fit into a variety of decks. You made some very good choices with the restrictions here - WU Enchantments with counterspells, RU Spellslinger, and WG Auras will all love this card. Not much else to say, it's an elegant design and it works with the restriction and typical design standards well. Flo00 : I like that the abilities can interact with each other somewhat and that they're simple but fitting for each color. Seems like a decent Commander product print. monger : Very clever mix of ETB tapped and paying life. 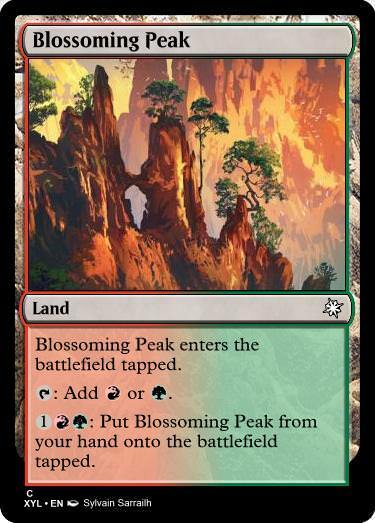 I'm not really sure how big a fan I am of it being a Mountain even with ETB tapped because not only does it make Farseek effectively cost , it also "almost toes strictly better than a basic" issue with its varied fixing and compartively small life payment (Shocklands require you to pay 2 life, after all.) I feel like this is a great card that tripped itself up a little too much trying to fit the challenge: Without the restriction I would suggest you also change it to just adding on ETB if you use the card again. That said I would like to see a variation of this used somewhere someday. 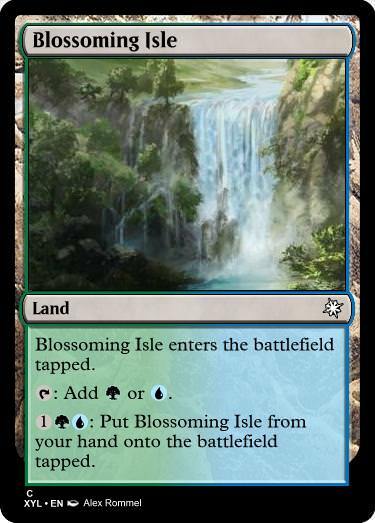 Jartis : Hm, I get what you were going for as a land but I think I would've liked this more as a land with just the first two abilities that tries to encourage you to use it as an easy sac outlet. That's not to say the card is bad - I think you picked the right Nephilim to call back to in terms of effect. Emeria, the Sky Ruin does make me think 3rd ability needs to be a little more expensive, though, like at least - more, even if that does force it towards just being an EDH piece. Here's a four-card cycle of lands you can ramp out. I kept the power level relatively safe on this, but I don't think it would break the game to make it cheaper. The challenge I have is actually one I used on the Planeswalker Game thread, but I think the difference in context will be interesting. 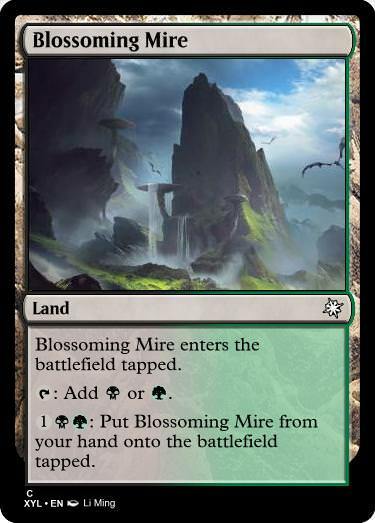 Your next challenge is to make a land card that uses or references a mechanic that has never been evergreen. Any non-evergreen keyword abilities, keyword actions, ability words are fair game! Good luck. 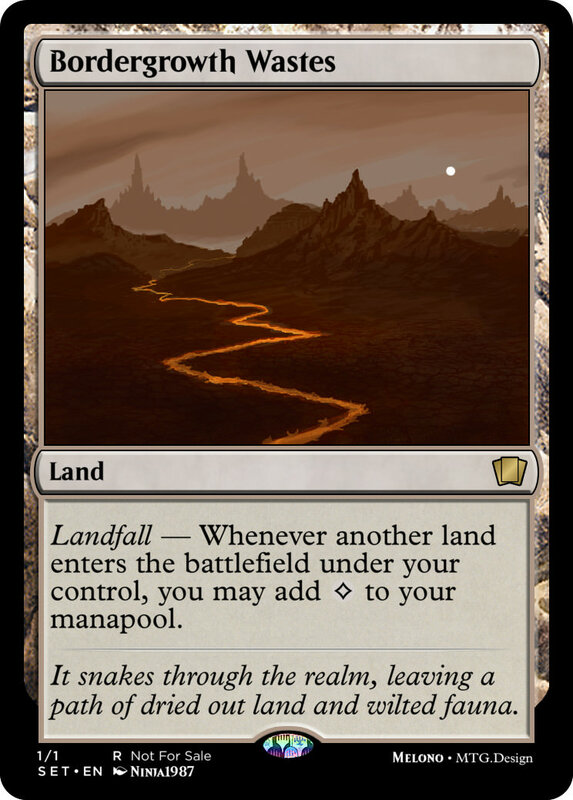 Landfall - Whenever another land enters the battlefield under your control, you may add to your manapool. It snakes through the realm, leaving a path of dried out land and wilted fauna. When ~ exploits a nontoken creature, untap it and add . Atlas Academy enters the battlefield tapped. When Atlas Academy enters the battlefield, it explores (Reveal the top card of your library. Put that card into your hand if it's a land. 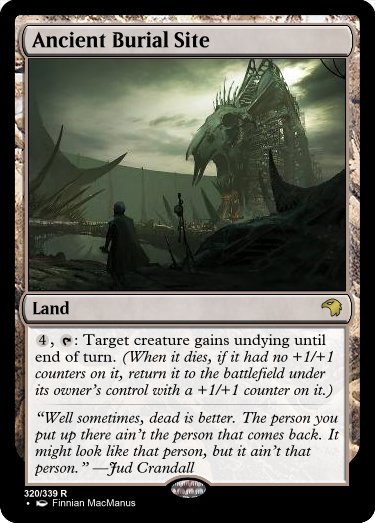 Otherwise, put a +1/+1 counter on this land, then put the card back on top or into your graveyard). Remove a +1/+1 counter from Atlas Academy: Atlas Academy gains the land subtype of your choice in addition to its other types. : Exile Arami, The Surreal World, then return it to the battlefield tapped at the beginning of the next end step. When ~ exploits a creature, untap it and add . I think to ante a card is a pretty big price (at least the old cards that deal with ante make me think so) so it should make more than two colors. Yeah, I'll judge in ~24 hours. Get those entries in! 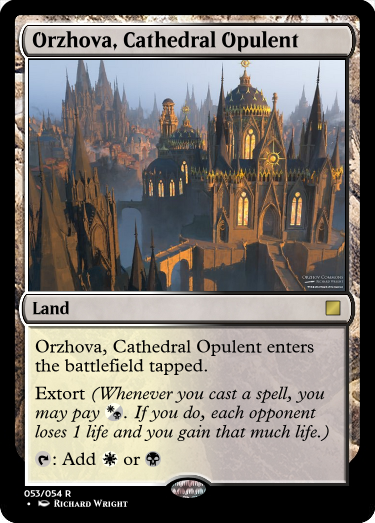 Jartis: I think the problem with Orzhova, Cathedral Opulent is that I don't think having extort on a land is something that can be done, especially since the only downside is that it ETB's tapped. I think I would have the card tap for colorless so it can't activate itself, or have some other downside akin to Gateway Plaza. Akai Ryu: I think Centaur of the Arena card works really well, because all it does is a one time +1/+0 boost that can be blocked and killed, which makes it fairly well costed to be on a land. 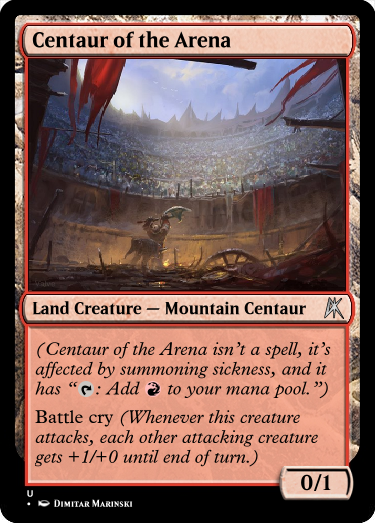 I think my only issue with the card is that it doesn't really make flavorful sense that a centaur is a land. viriss: Ancient Burial Site is a cool card. The activation cost seems really fair, and I like the implications of the flavor text. However, I think the card would feel more cohesive if you increased the cost of the ability and let it tap for colorless or black, as I think that lands should have to have some mana production ability. 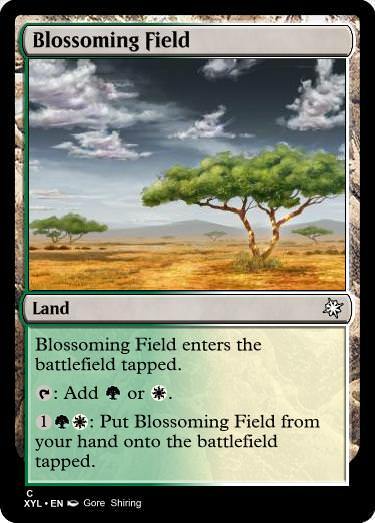 melono: Bordergrowth Wastes feels like a balanced card at first glance, but I think fetchlands break it way too easily. There's a reason Lotus Cobra was at mythic. 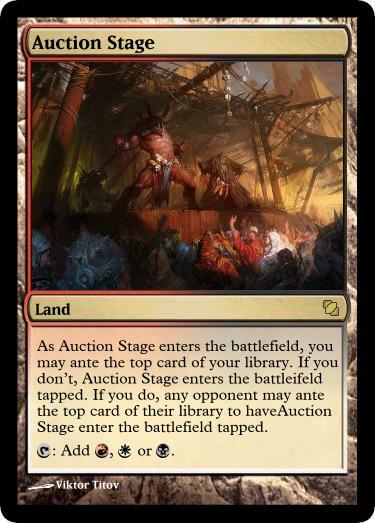 Also, I think in a normal deck, it would be unfun to have a land that only works when you have another land to play. monger: Infested Riverbed seems like a pretty fair card - I don't think it gets broken by affinity, and sacrificing a creature to add two mana one time is a pretty fair rate. amechra: I like Arami, the Surreal World, but I think the problem with it is after a certain threshold of lands you control, the second ability stops being as relevant, and just ends up leaving you with a land in exile for no reason. I do really enjoy the flavor and flexibility of the card, though. Nice card! Flo00: Auction Stage is a decent idea, but there's a reason why ante is an 11 on the storm scale. Also, potentially losing a random card at the top of your deck is not worth having a random land ETB untapped. And now, onto our winners! Congratulations to our winners and to everyone who participated! Is it too late to post in this thread? 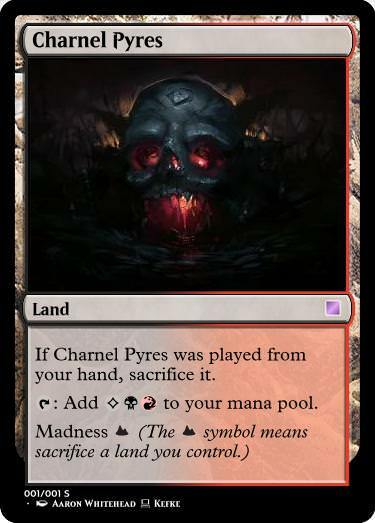 Mark Rosewater said once that Madness could be put on anything but lands. I took that as a challenge. Ok so, when are you supposed to sacrifice this? I think you're going for something like "When CARDNAME enters the battlefield, if it was played from your hand, sacrifice it", but I am not sure. You would also need to add "enters the battlefield tapped" or, if you really want to complicate your life, something like a "You can't activate CARDNAME's mana abilities in response to this." clause, because otherwise there's nothing stopping you from playing this, immediately tapping it, and getting three mana from it, if I remember correctly. Secondly, and this is the most important part, madness doesn't work with lands because it lets you discard cards from exile and then cast them from exile. Only spells can be cast. 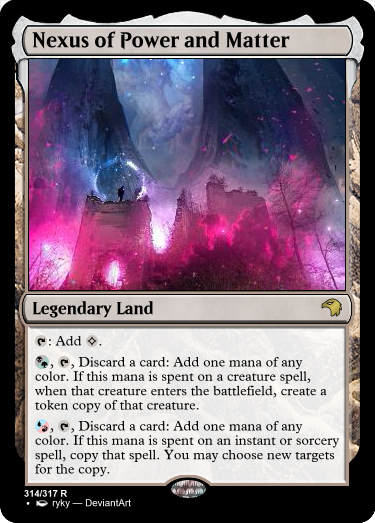 Lands are not spells, they can not be cast, they can only be played. That's the real reason madness literally can not be on lands, even though you can technically put a madness-like effect on lands. 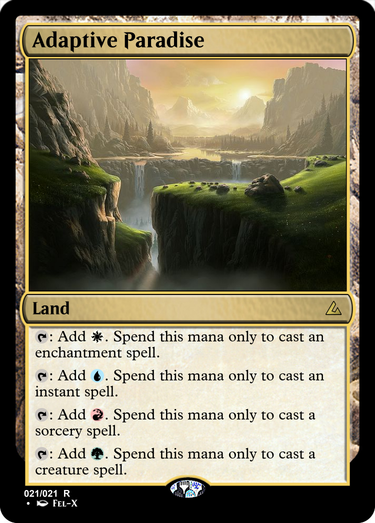 If you wanted a madness-like effect on a land, you'd have to spell it out and substitute "cast" with either "play" (lands can only be played during a main phase on your turn and only if you haven't already exhausted your land drops, usually 1, for that turn, so this technically wouldn't need any additional specifier; but, since 'play' is a general term, putting some reminder text for that might be worth it if the rest of the card doesn't get too wordy, haven't checked yet) or "put into your hand from the battlefield" (which would allow you to potentially get several new lands at instant speed each turn and is thus problematic power-level-wise and thus best avoided). Also, lands that can produce three mana feel worrying when compared to something like the Azorius Chancery cycle, but that's probably something that can be addressed later when we've hammered out how the rest of the card is supposed to function in practice. 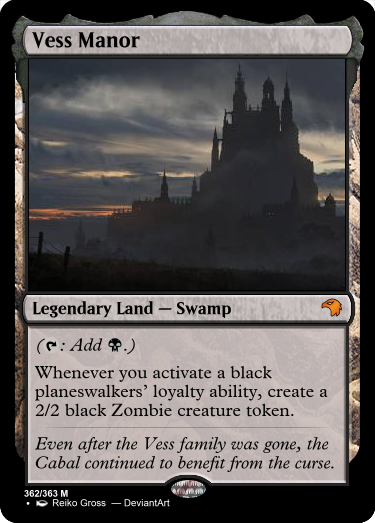 Ok, NEXT: Make a land that interacts with planeswalkers in a creative way (you can use new mechanics, new ways of interaction, etc. Something fun). Was more tired than I thought when I did the first, hastily deleted version of this. Now it isn't insanely broken. Is it original? Maybe. Would it be fun? I hope. Does it work? Probably not, but better than the last version! Just trying something completely different. Inspired by Daij_Djan's The Balsantian Chapel from card of the week #243 being not much alive either. It might be a bit too powerful though? 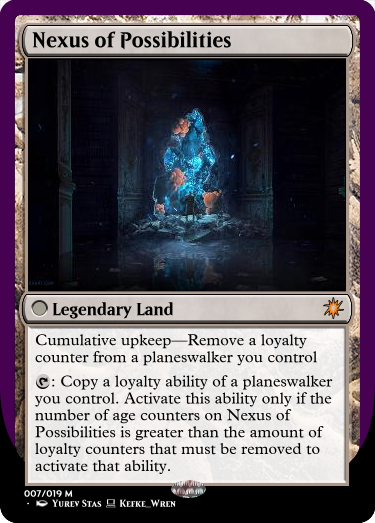 : Put a loyalty counter on target planeswalker. : Create Meadow Angel Paster, a legendary Paster Planeswalker token with " : Put a 4/4 Angel creature token with flying onto the battlefield."